Platform Microsoft Xbox 360. Type Power Cable. Cable Length Not Applicable. Model Not Applicable. Compatible With Microsoft: Xbox 360, XBOX 360 Slim. Cable Length: Approx. 3X(New generic USB Charging Cable for soft Xbox 360 Wireless ControllerCharges your XBOX 360 wireless controllers through any USB portCompatible With soft: Xbox 360, XBOX 360 SlimCable Length: Approx. 180cmQuantity:1100% Brand New and high qualityUSB cable allows you to charge your soft xBox 360 Wireless Controller while playing gamesNever runs out battery again while you are about to strike your final scoreType: genericAccessory ONLY, Wireless Controller not includedColor: GrayPackage Contents:1x USB Charger Power Cord Cable For soft Xbox 360 Wireless ControllerNote:Light shooting and different displays may cause the color of the item in the picture a little different from the real thing.The measurement allowed error is /-1-3 cm. .
Use this cable to connect the Xbox 360 power cable to the Xbox One console. 2X(AC adapter transfer cable for Xbox One. This is a high quality AC adapter cable for Xbox One. Note: Accessories only, the Xbox One console is not included. ). This unit has been thoroughly inspected, repaired and tested by our in-house, factory-trained technicians. You can expect a fully-functional unit. Platform Microsoft Xbox 360. General Interest. Installation Support. Xbox 360 AC Adapter & S-Video AV Cable Bundle (KMD). Includes: 1 Xbox 360 AC Adapter, 1 SAV Cable. SAV Cable is not compatible with Xbox 360 E. 24 HR RESPONSE. Includes everything you need to get your Xbox 360 up and running: Xbox 360 AC Adapter & S-Video AV Cable. 10x(AC adapter transfer cable for Xbox OneUse this cable to connect the Xbox 360 power cable to the Xbox One consoleIdeal accessory, use old power supply for new consolePerfect replacement of damaged AC adapter cableTotal length: about 28, 5 cm / 11.2 inchColor:BlackThis is a high quality AC adapter cable for Xbox One.Save money, get an adapter / converter cable instead of the actual power supplyNote: Accessories only, the Xbox One console is not included.Package Contents: 1 x 360 XBOX One converter cableNote: Light shooting and different displays may cause the color of the item in the picture a little different from the real thing. The measurement allowed error is /- 1-3cm. Brand Unbranded Designer/Brand Unbranded MPN Does not . 8X(AC adapter transfer cable for Xbox OneUse this cable to connect the Xbox 360 power cable to the Xbox One consoleIdeal accessory, use old power supply for new consolePerfect replacement of damaged AC adapter cableTotal length: about 28, 5 cm / 11.2 inchColor:BlackThis is a high quality AC adapter cable for Xbox One.Save money, get an adapter / converter cable instead of the actual power supplyNote: Accessories only, the Xbox One console is not included.Package Contents: 1 x 360 XBOX One converter cableNote: Light shooting and different displays may cause the color of the item in the picture a little different from the real thing. The measurement allowed error is /- 1-3cm.) MPN Does not apply Brand Unbranded EAN 190268294683 UP. 10X(AC adapter transfer cable for Xbox OneUse this cable to connect the Xbox 360 power cable to the Xbox One consoleIdeal accessory, use old power supply for new consolePerfect replacement of damaged AC adapter cableTotal length: about 28, 5 cm / 11.2 inchColor:BlackThis is a high quality AC adapter cable for Xbox One.Save money, get an adapter / converter cable instead of the actual power supplyNote: Accessories only, the Xbox One console is not included.Package Contents: 1 x 360 XBOX One converter cableNote: Light shooting and different displays may cause the color of the item in the picture a little different from the real thing. The measurement allowed error is /- 1-3cm.) MPN Does not apply Brand Unbranded EAN 190268294683 U. 2X(AC adapter transfer cable for Xbox OneUse this cable to connect the Xbox 360 power cable to the Xbox One consoleIdeal accessory, use old power supply for new consolePerfect replacement of damaged AC adapter cableTotal length: about 28, 5 cm / 11.2 inchColor:BlackThis is a high quality AC adapter cable for Xbox One.Save money, get an adapter / converter cable instead of the actual power supplyNote: Accessories only, the Xbox One console is not included.Package Contents: 1 x 360 XBOX One converter cableNote: Light shooting and different displays may cause the color of the item in the picture a little different from the real thing. The measurement allowed error is /- 1-3cm.) MPN Does not apply Brand Unbranded EAN 190268294683 UP. 20X(AC adapter transfer cable for Xbox OneUse this cable to connect the Xbox 360 power cable to the Xbox One consoleIdeal accessory, use old power supply for new consolePerfect replacement of damaged AC adapter cableTotal length: about 28, 5 cm / 11.2 inchColor:BlackThis is a high quality AC adapter cable for Xbox One.Save money, get an adapter / converter cable instead of the actual power supplyNote: Accessories only, the Xbox One console is not included.Package Contents: 1 x 360 XBOX One converter cableNote: Light shooting and different displays may cause the color of the item in the picture a little different from the real thing. The measurement allowed error is /- 1-3cm.) MPN Does not apply Brand Unbranded EAN 190268294683 U. Platform XBOX 360. 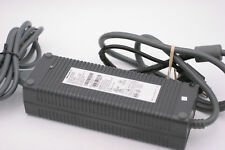 Sub-Type ac Power cord. NON CONTINENTAL USA AK / HI / PR / APO / FPO / & OTHER US TERRITORIES. Use this cable to connect the Xbox 360 power cable to the Xbox One console. AC adapter transfer cable for Xbox One. This is a high quality AC adapter cable for Xbox One. Note: Accessories only, the Xbox One console is not included. Hard Drive Caddies. Output current: 16.5 A. USB/Pen/Key/Flash Drives. Compatibility: Microsoft Xbox. Cables included: AC. Wireless Networking. Colour of product: Black. Images for illustration purposes only. Original Microsoft XBOX 360 Model - White Console. This is an original 360 model, there is no HDMI port. Power cord. In very good working order complete with;. Connect an AC adapter to an AC outlet, OR plug directly into a computer or other device with a built-in AC adapter. 1 x EU Plug Power Cable. Fit most 3 ports power adapters. Note: Suitable for EU standard jack ONLY. Remove active content. - Australian Plug. Features: - Length: 170cm. Does Not Apply. Connect an AC adapter to an AC outlet, OR plug directly into a computer or other device with a built-in AC adapter. Fit most 3 ports power adapters. 1 x UK Plug Power Cable. Note: Suitable for EU standard jack ONLY. Platform Microsoft Xbox 360. Check Out The Coolest Stuff Here. Color White.